The moment is there! You're going to make the Trengo Chatbot ready for use 🤖🎉. By going to https://web.trengo.eu/admin/chatbots, you can click on the green plus sign (+) to create the first Chatbot. When you create a Chatbot, you'll first be asked which language (Chatbot language) the Chatbot should understand. This is important, so the Chatbot can give good suggestions in the selected language. In addition, you're asked on which channels the Chatbot will work. Select the relevant channels such as Website chat, Facebook, Twitter and/or Telegram. Once you've requested and/or linked channels in Trengo, you can select the relevant channels here. You don't have to worry that the Chatbot will be active immediately. You can first set up the Chatbot on your own and publish it at a later time. The Chatbot won't be active on the selected channels yet. In the meantime, you're able to fill it with information and extensivly test it. Go to dialogflow.com and login with a Google account. 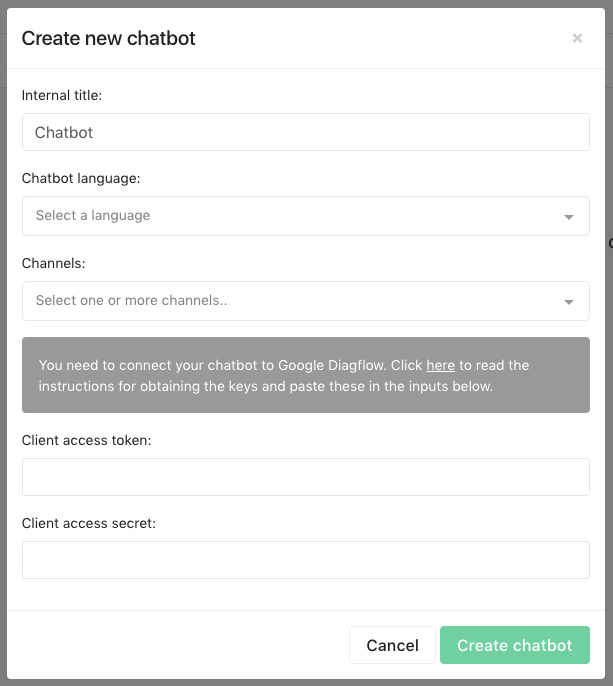 Give Dialogflow access to the Google account and click on "Allow". Accept (if agreed upon) the conditions by clicking "Accept". Click on "Create agent" in left menu. Come up with a name for the Chatbot, select the desired languages, click on "Create" and wait for the Chatbot to be created. Once it's been created, click on the gearwheel icon in the left menu next to the arrow. Set the "API VERSION" to "V1 API" and click "Save". Copy the "Client access token" and the "Developer access token" and paste the values into the fields in Trengo (see the image above). Click on "Create chatbot"; the Chatbot is then ready for use! Once this has happened, you can start using "Smalltalk" and your own questions. Read more about how you can activate "Smalltalk" and why we recommend this.